Do you have a question for us? Click on the link for that, and we will get back to you shortly! Before doing that you might check this list of answered questions, maybe you can find your answer here. Shelfster is a free solution that allows you to gather information from everywhere, write articles, publish them to your WordPress blog or save them as WordPress drafts. What's so special about Shelfster? You can manage in one place all the information you've previously gathered and easily write articles. You don't have to worry anymore that your ideas, collected data and sources of inspiration are lost or scattered in different places. How can I gather information for an article? Shelfster has several free capturing tools for your desktop (Windows, Mac), browser (Chrome, Firefox, Bookmarklet) and smartphone (iPhone, Android, iPad - Apps built by Mobiversal) that allow you to capture ideas, images, text snippets, voice notes, web pages and save&send them in your Shelfster online account. What do I do after I've saved a bunch of stuff with the capturing tools? You can login in your online account and access them at any time, keep them organized or use them for your articles. You can move images and text into the article you've started writing, using simple drag and drop. An item is a piece of information (idea, image, text snippet, web page, voice note) saved with the capturing tools. An article is a text file that you can create with the Online Editor. What can I do with an ARTICLE? You can save, delete, publish it to your WordPress blog or save it as WordPress draft. A project is a folder where you can store items and articles. It will help you organize your work. How can I hide the left panel so I can focus on my writing? Just click on the bar with the small arrow "<", and the left panel will be hidden. How do I activate meta tags on my WordPress blog? 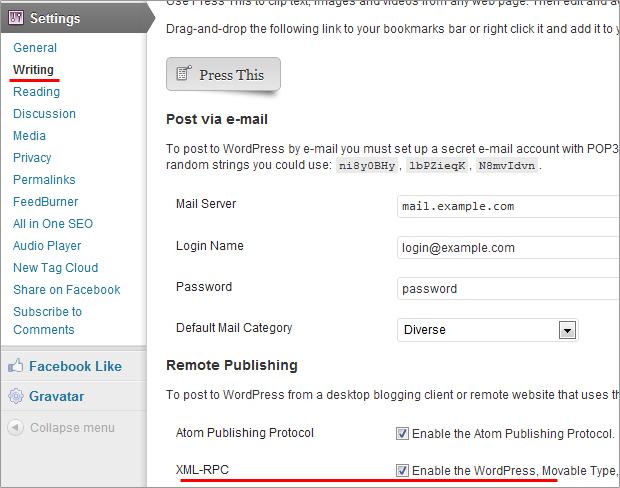 How do I activate the XML-RPC protocol in WordPress blog?